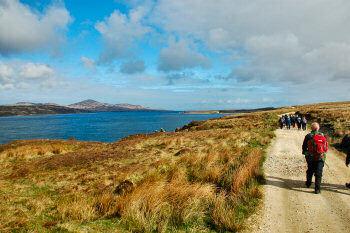 The original plan for today's walk was to take the ferry from Islay to Colonsay and spend a few hours on the island. 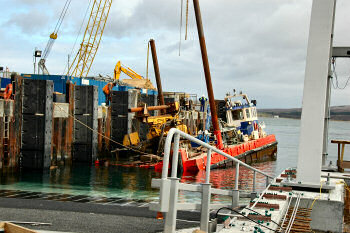 With the various delays during the building work at Port Askaig that was soon thrown into doubt. From March the completion date soon slipped into April and has most recently been given as the 7th of May. I have yet to find someone (apart from the council) who believes in the 7th of May. Seeing Port Askaig pier with my own eyes today I can't believe it either, especially as they had another mishap today with the barge getting stuck under a fender and looking like it was going to sink if the tide rose any higher. In any case, our walk had long been relocated to Jura. We took the small ferry to Jura (still running as normal and not impacted by the building work) and led by James How turned north on the track to Inver. Very nice views were to be had over the Sound of Islay, taking in Caol Ila distillery first, later followed by Bunnahabhain distillery. There were various oportunities to see some of Jura's huge deer population as well as some impressive Highland cattle (and their calves). We walked north until we were well past Bunnahabhain on the Islay side, almost at the height of the lighthouse. Here we turned off the main track and followed a small track, more a path in places, down to the shore. We arrived in a small bay with a beach, looking out to the lighthouse. As we arrived the ferry passed the lighthouse on the way to Colonsay (it's still making the journey to Colonsay on Wednesdays, but leaving from Port Ellen and taking much longer). Lunch was enjoyed at the beach, looking out over the sound. For the return leg we initially tracked back the same way we had come, giving us a good view of some work using the helicopter at the fish farm. From Inver onwards we walked along the beach until we reached Feolin. 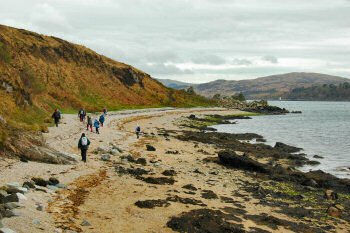 A good replacement walk for the planned Colonsay walk (may be next year? 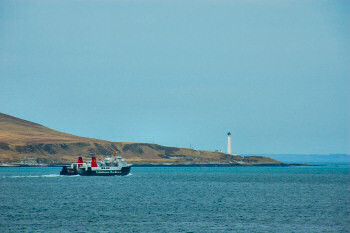 ), giving some nice and different views of Islay over the sound. Not to forget to see where we had walked on Sunday. I'm now having a relaxing evening here at the Coachman's Flat at Sornbank before going to bed for an early night. I have an early start ahead on Thursday, meeting in Port Askaig at 08:15 for the 08:30 ferry to Jura. Together with 20 other walkers (I believe the walk is full) I'll be walking around Corra Bheinn, led by Gordon Muir. For those not going to Jura there are a number of options: Two different walks at the RSPB Loch Gruinart reserve in the morning and an afternoon walk around Loch Gearach (meet at the Port Charlotte football pitch 13:45). Later in the evening there will be a wildlife talk at the Islay Natural History Trust in Port Charlotte, starting at 20:00. I'm planning to attend that as well, meaning tomorrow's update might be fairly late or have to wait until Friday. Good night and keep walking!